Maricel Presilla’s Gran Cocina Latina (Great Latin Cuisine) is a magnum opus in every sense of the phrase and I love it. It’s a huge work of 901 pages which took Presilla nearly 30 years to research and write. And it shows. 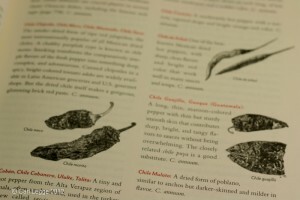 It covers the history, lore, culture and recipes of Latin American food & cooking. It’s more than a recipe book: it’s social history and travelogue too. 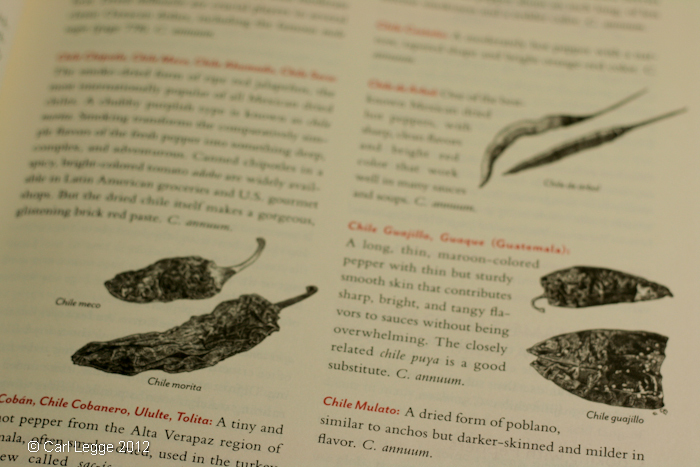 I wanted a book to help me learn about the cuisine of Latin America – this will be my bible. Presilla is a polymath. Originally from Cuba, she emigrated to the USA. She is a Doctor in medieval history; an award winning chef and owner of two Latin restaurants in New Jersey; she has written a cultural & natural history of cacao and spoke in October 2012 at the Chocolate Unwrapped show in London. Her particular mix of knowledge, skills & experience make her uniquely qualified to write this book. 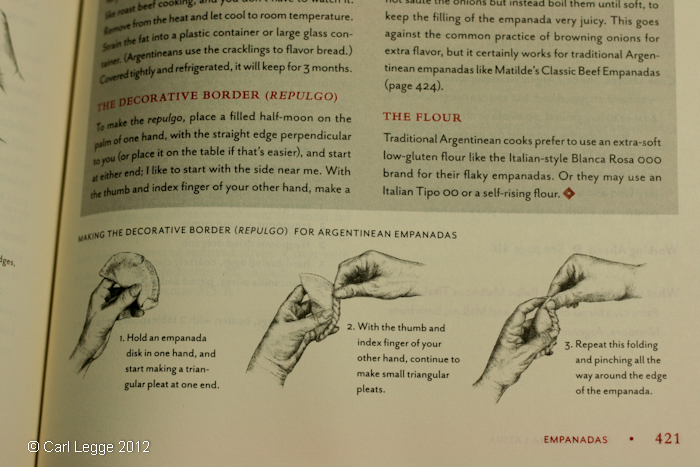 The book starts with explanations and descriptions of Latin America and the latin kitchen. Presilla clearly explains how in latin cooking the flavours are built up in layers: from adobo and sofrito through to the table condiments. This contrasts with other cuisines which may fuse or blend flavours. The middle chapters are divided into 16 food groupings: tropical roots & starchy vegetables; squashes, corn, quinoa, and beans; rice; drinks; little Latin dishes; empanadas; the tamal family; cebiches; La Olla (soups & hearty potages); salads; breads; fish and seafood; poultry; meat; hot pepper pots and dulce Latino (sweets & desserts). Each chapter starts with a ‘Chapter at a view’ page: a mini-contents for that chapter. 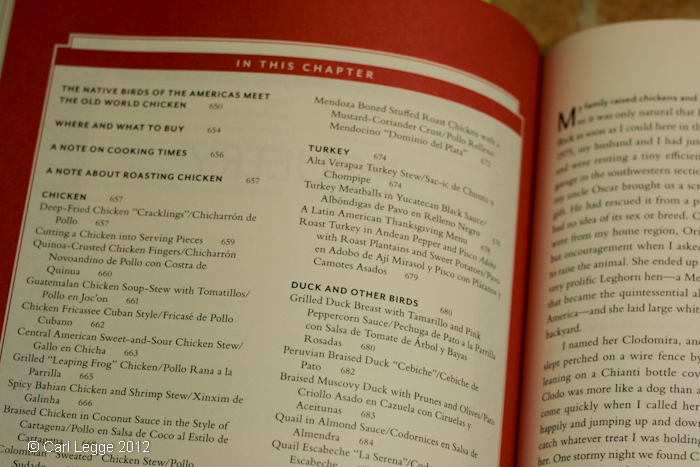 This makes choosing recipes really easy without having to thumb endlessly through this enormous book. Then there is a really useful introduction to the particular topic covering its place in Latin cooking & its history, typical ingredients and dishes as they vary around the continent. The introductions are spiced with generous stories and anecdotes which bring the food & cooking to life. 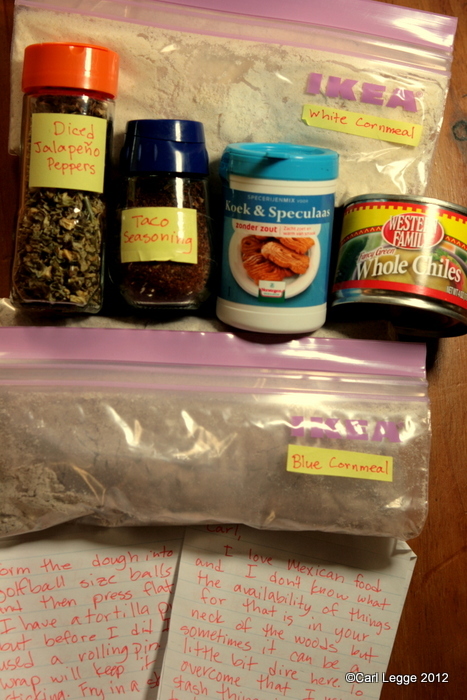 I found the recipes that follow clearly written and easy to cook by. The measurements are in cups and ounces as the book was intended for the US market. I suggest anyone cooking with it does what I’ve done and buy some cup measures and gets used to multiplying ounces by 25g. I thought the design and lay out of the recipes is well executed with the busy cook in mind. There are Cook’s Notes helping you understand the approach to the recipe; details of what you can do ahead of time; suggestions of what to drink with the dish; bulleted points and boxed out notes help with anything that needs further explanation. I also really like the line drawn illustrations which are clear and very informative. The photography has clearly met Presilla’s brief to the photography team who achieved what Presilla calls “…a Vermeer-like understanding of light and composition…” I would have preferred more conventionally lit photography. However, the treatment does not detract from seeing what many of the recipes look like and certainly conveys something of the atmosphere of the cuisine. I bought this book because I wanted to know more about Latin American cuisine and its DNA as it were. Through chance and luck, I am growing many South American foods here in North Wales that are not usual in Western Europe. We are growing oca, ulluco, mashua, rocoto, yacon, talets, hopniss, achocha and pepino. These potentially could be crops that will thrive here and there is little work done on recipes to use them in our cooking. 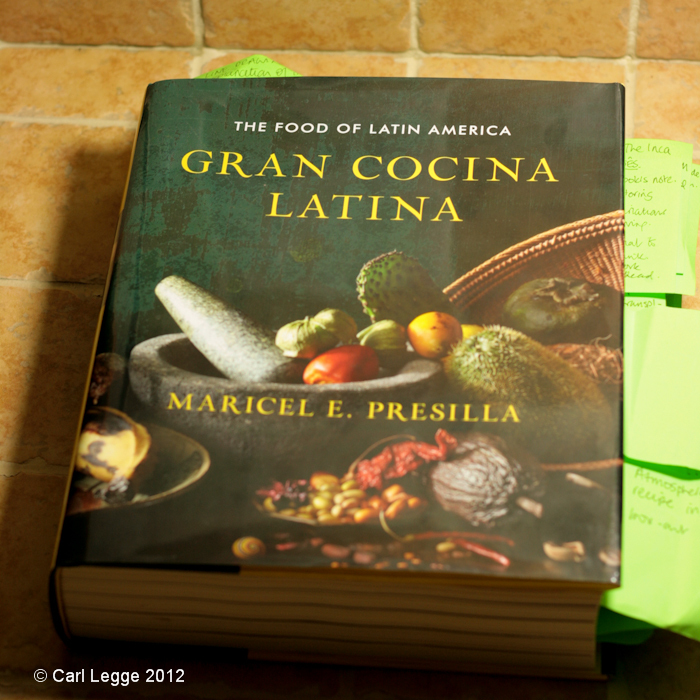 Presilla’s Gran Cocina Latina is an excellent piece of writing which will help me understand their cultural roots and hopefully contribute to a new chapter for them in the northern hemisphere. If you have an interest in Latin America and its culture and history, this is an excellent read and essential in my view. If you have a passion for world food & cooking, this book needs to be on your lap to enjoy the journey through place and time. Gran Cocina Latina is available at Amazon.